This entry was posted in Racing on August 30, 2010 by Steve Tilford. First of all, I need to say that Julie Carter did an amazing job with the Hotter’n Hell long weekend. This race was promoted like all races should be. It is rare that I leave a race without observing any major promotional snafus, but I can honestly say I did not witness one mistake. It was a huge task. Thanks Julie. 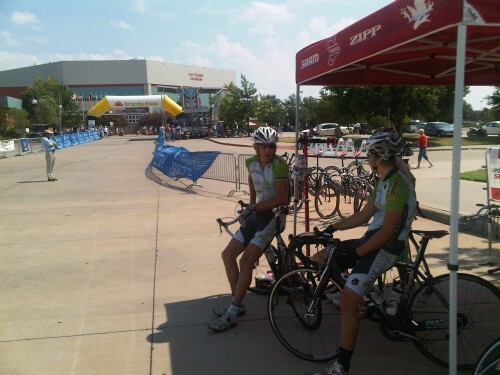 The last criterium was hot, finally. The PRO 1/2 race didn’t start until 12:15. It was kind of a figure 8 course by the expo area again and it was pretty breezy. It would have been a fun criterium to watch. Really animated. Finally, a break of the strong guys got away – 1st and 2nd from the day before, Russ Walker and Logan Hutchings, plus Patrick McCarty, Stefan Rothe and one Squadra rider. Those 5 were going pretty good. The field did slow down for a few minutes after about 1/2 the 75 minute race, but it wasn’t really ever easy. There was a ton of attrition. Lots of guys getting dropped. Raul Acala’s Mexican team did make it to the race today. On Saturday’s early morning start for the road race, they got mixed up with the other 15000 bike riders and missed the start by 5 minutes. They did a TTT for 20km, but eventually bagged it. There was no way that they could have caught the field that morning. We were rolling 52 kph for the first 45 minutes at least. Anyway, the break looked like it was good until the last 5 laps. That is when the field started going much faster. With 4 laps to go there was a crash going into the last corner. Only a couple guys fell, but it split the field and a lot of guys never got back on. I was behind that crash, but caught on pretty quickly. I had okay position on the final lap. Hotel San Jose was lined up for Josh Carter. 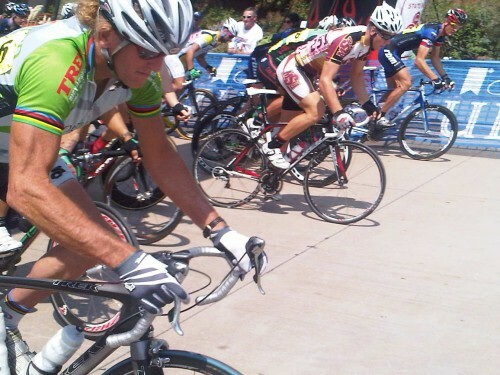 I was about 10 riders back, but had one of Raul’s team mates in front of me. That isn’t a good thing. Cornering isn’t one of their fortes. I kept thinking he was coming off, but he was just opening a gap coming out of the corner and then sprinted back up. I wasted a ton of energy trying to get by him. 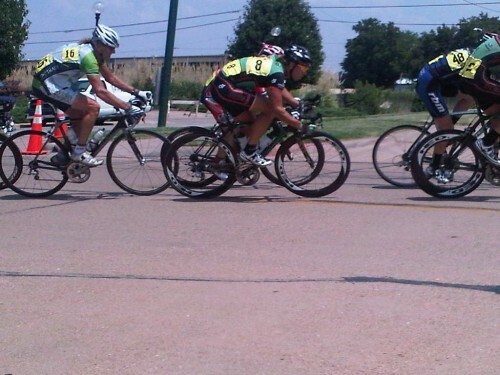 Anyway, by the time I needed to really move up to sprint, the field was sprinting into the break. I only passed a couple guys and ended up 11th. Logan Hutchings snagged the win from Russ Walker with the results from the day before being reversed. They were the only two that were left from the break. Overall, Logan Hutchings ended up winning the omnium. He tied local favorite and his team mate Josh Carter. I was 9th overall. All I can figure is not many guys finished in the points all three races. It’s another short week. The Labor Day races in St. Louis start Friday night. 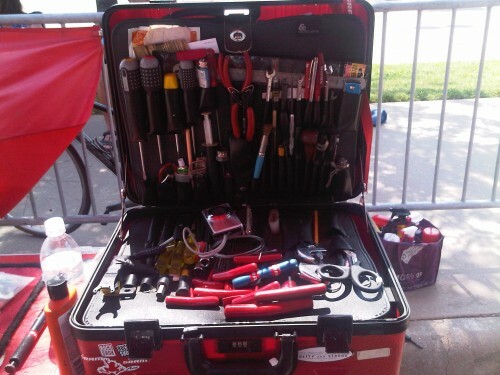 It’s 4 criteriums. Pretty good for training, but not my favorite venues. The races have gotten flatter and easier through the years. The last race on Monday has a new site. Hopefully this course will be more challenging. On a side note, I got pulled over coming back before Oklahoma City doing 68 in a 55mph work zone. I thought I was jacked. I went back into the Highway Patrol car and just talked to the guy for a bit. He took my driver’s license info, insurance and punched it all into his mobile laptop. Then a portable printer spit out the ticket. But, in my case it just spat out a warning. Again, I’m not sure why that occurred, but it probably saved me $500, at least. Kind of an interesting race start photo. Hanging in the shade at the SRAM tent before the mid day start.